Every season of Lakmé Fashion Week I try and do something different. While a trend post is a constant every season, I try and change things around so that the readers have an interesting and new perspective every season. For Summer/Resort 2015, I decided to do a post featuring my favourite 5 collections of the season. Since I have never done this before now seemed like the perfect time to do one. While a number of collections left an impact, these ones were my absolute favourites. I have always been a fan of Karishma Shahani Khan’s aesthetics. From her innovative layering to her trademark tie-dye techniques, Karishma always manages to impress me with her collection. For her Summer/Resort 2015 collection, Karishma decided to pay homage to the classic shade Neel (indigo). Working with a primarily colour palette, beside neel, the collection also had elements of red, mustard and white. 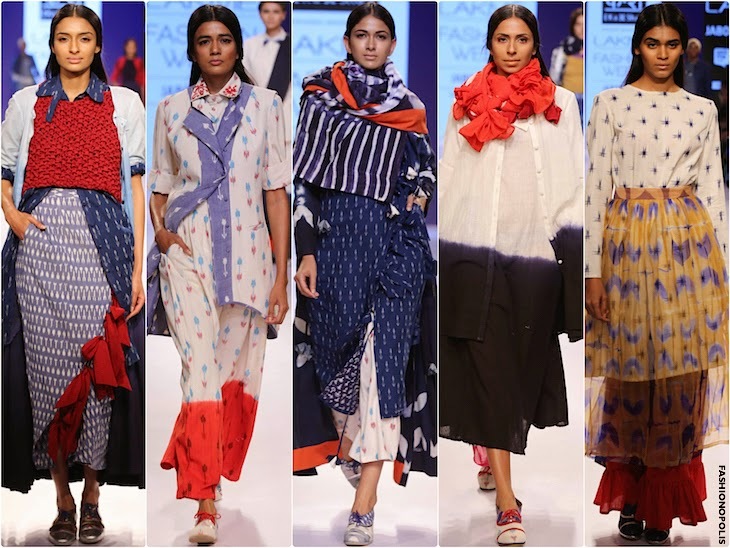 Traditional weaves and colours along with arrow print motif, ikat, dip dye hemlines and statement red bow showcased in a variety of interesting silhouettes and layers made this one of the most remarkable collections of the season. Payal Singhal is one of the few designers who has managed to comfortably merge high fashion with commercial viability. She creates pieces that are both, artistic and wearable. Finding inspiration in Amer Fort's Sheesh Mahal, Payal Singhal’s Lakmé Fashion Week Summer/Resort 2015 collection was a shimmery affair. Working with separates and a pastel palette of coral, blush, ecru and grey, the collection featured a fine blend of Indo-Western silhouettes. From Long pleated length skirts to tiny body-con cholis to elegant palazzos, summer friendly silhouettes were in abundance. The highlight of the collection was the intricate patterns and fine detailed mirror mosaic embroidery inspired from the walls of the palace. 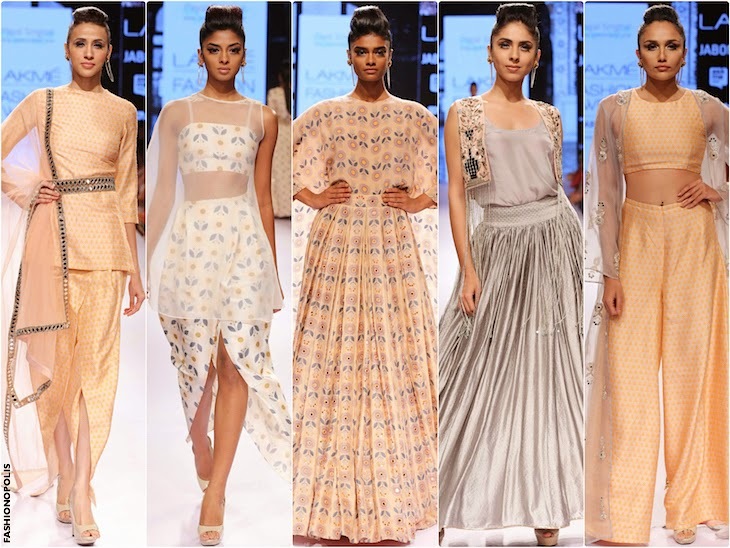 Payal managed to beautifully balance out modern fusion silhouettes with traditional mirror and zardozi work. Never have I seen a Pankaj and Nidhi show and not fallen in love with it. 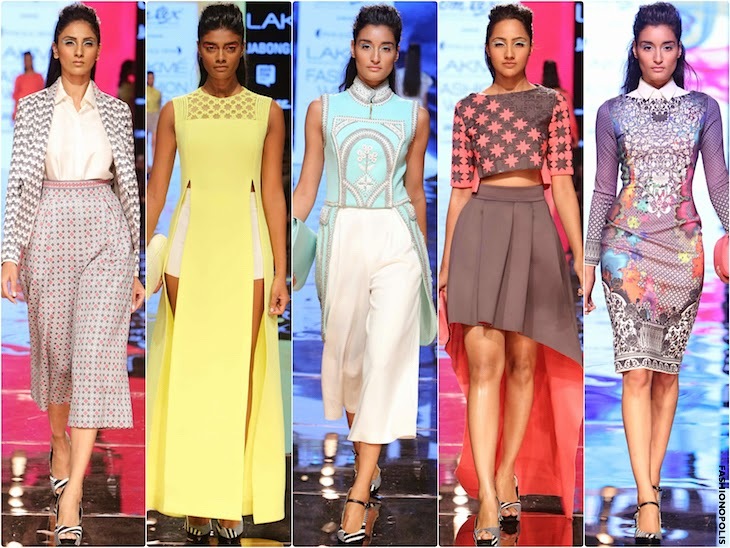 Their Lakmé Fashion Week Summer/Resort 2015 collection was exactly what I expected it to be-vibrant, experimental and absolutely stunning. Inspired by Iznik pottery designs and Op-Art patterns, the multi-coloured prints, laser cut detailing and intricate appliqués were the key highlights of the collection. Known for their graphic designs and patterns, the collection offered a variety of those in a multi-colour palette and sharp silhouettes. The clever use of prints, solids and laser cut detailing gave the collection an extra edge. The beauty of this collection is, along with being high on the aesthetic quotient, the collection is also very practical and wearable.